So, I have become a little addicted to Deborah Lippmann's polishes. It seems like as soon as I say I'm done, HSN will have a fabulous deal to which that I just can't say no. My most recent purchase from HSN included the Run the World (Girls) neon box set (review coming soon), as well as a duo of Don't Tell Mama and Dream a Little Dream of Me. 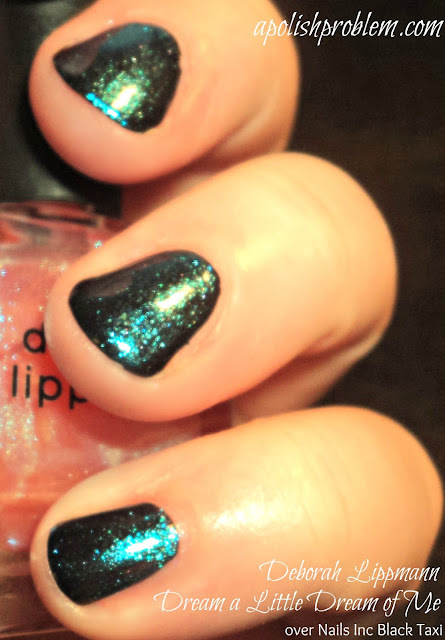 The above 2 pictures show 2 coats of Dream a Little Dream of Me over 2 coats of Nails Inc Black Taxi. Isn't it amazing? It doesn't even look like the same polish. Layering it over a dark base color, completely turns this one from a "no" to a resounding "YES". The dark base essentially makes the sheer pink base color go away and you are left with the amazing blue shimmer. This really reminds me of the long-discontinued China Glaze Blk Bila Bong or maybe even Chanel Nuit de Russie. I think this would look fantastic layered over other dark bases as well. I can't wait to try it over a navy blue or a deep, vampy purple. Deborah Lippmann Dream a Little Dream of Me can be found at various online stores including HSN.com (where I purchased mine). I got mine in a clearance duo, which is sadly out of stock now, but HSN still carries this polish as a single. Dream a Little Dream of Me retails for $16 a bottle. 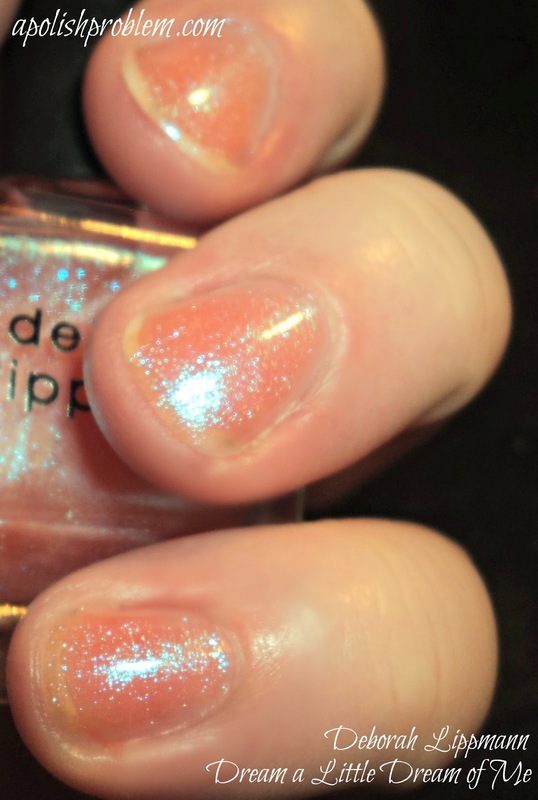 Deborah Lippmann Dream a Little Dream of Me was purchased by me. The above link links to this product at HSN.com and is not an affiliate link. What a transformation ober black. Its stunning! i love it alone and over black! WOA!!!!! looks totally different over black!!! I love it! good thing you didn't send back!! !